We process and/or supply many Specification Grades of elastomer as sheet jointings and precision cut gaskets. In addition to those on this page, we have many other customer and industry specification materials that suit particular applications. • * DTD 5594A Grades 60, 70, 80, 90. • Def Standard 22-005 (NES 2005) Grades BA(H)60, BA(H)70, BA(H)80. • ABR 4-0106 Issue 3 Grades 45, 55, 65, 75. • BS3227 Grades B60, B70. • BS6014 Grades EP60S, EP70S, EP80S. • * DTD 818 Classes L2, L3, L4, L5, N2, N3, N4, N5. This material resists mineral and synthetic oils. 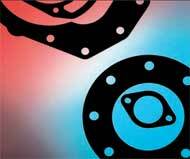 • Viton® polymers are supplied when specified. We are UK Authorised Distributor for the design, supply and technical support of sealing and fluid handling parts made from DuPont Performance Elastomers’ Kalrez®. This high performance elastomeric material combines the resilience and sealing ability of rubber with almost universal chemical resistance and temperature capabilities up to 316°C. *All DTD specifications have been declared OBSOLETE.